AgeWell trains and employs older persons to be AgeWell companions or “AgeWells” who visit other older persons in their homes, reducing isolation and promoting a sense of well-being and community. 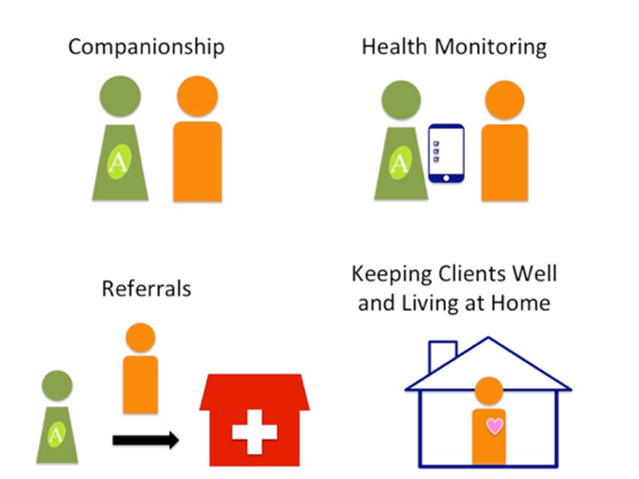 AgeWells provide companionship, monitor wellbeing, and make referrals to medical and social service providers. AgeWell’s mobile health system allows AgeWells to collect wellness information and to make informed recommendations on medical and social service needs. Their efforts contribute to identifying potential health issues early, allowing for out-patient assessment and management, keeping people out of hospitals and institutions and in their homes. AgeWell’s model complements the efforts of other social and medical providers and can generate significant cost savings to the medical system. AgeWell’s model has global application. AgeWell believes in the power of the peer-to-peer approach to keep people well. As m2m has proven in its peer-based approach, peers are better able to connect with their clients and thus better positioned to provide companionship and promote wellness. AgeWell firmly believes in the empowerment and sense of commitment that is engendered by a paying job. AgeWell companions are trained to provide a service and are compensated for the work they do.